Many of you have heard me mention Natural Zing before. However, I've never focused on them, or their service, before. So, today I'm making them the focuse of a Take the Time Tuesday blog entry! Natural Zing is an online source for just about everything a raw foodist needs and wants. They sell appliances, books, packaged raw foods, bulk nuts, raw olives, and so much more. When I was putting together a raw food spiritual retreat last year, Natural Zing contacted me and asked if I'd like them to donate some snacks for those attending the retreat. Nice, right? Prior to that, I never had any experience with Natural Zing. That quickly changed, however. Since the festival, I've gotten to know Jeff and his beautiful wife, Helen, even more. They are remarkable individuals who have created an amazing business. Natural Zing is the leading distributor of raw, vegan, organic foods in the US and Canada. You don't get to be the leader without putting a lot of passion and purpose behind what you are doing. I witnessed first-hand how Natural Zing makes certain the products they are selling are of the best quality and from the best sources possible. While at the Raw Spirit Festival, Jeff was approached by countless individuals wanting their products sold through the Natural Zing store. He questioned what the sources for ingredients were, explaining that just because something is raw and organic it doesn't mean it's made from quality ingredients. He's pretty strict with what he'll carry, so I'm always comfortable trusting what is available through the Natural Zing store. If you visit the Natural Zing web site, you'll quickly see they aren't just an online store trying to make money. They have an education tab to educate their customers about healthy practices, they use only 100% recycled paper in the office, they recycle boxes (I've seen this---Jeff saved every piece of cardboard from the Raw Spirit Festival and paid to have it shipped back to the Natural Zing office for re-use! ), uses soluble packing materials, and even gets their electricity from a 100% green bio-mass generation facility. 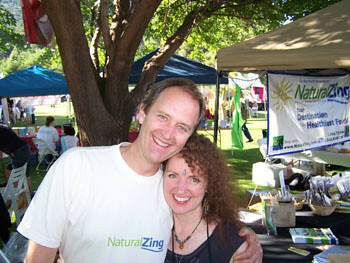 In addition to Natural Zing, Jeff and Helen founded the Spirit Bliss Community, a non-profit educational organization that provides events, seminars, and other learning experiences on raw vegan nutrition and how to grow organic food. ? ADDED: I JUST received my Natural Zing order, not long after posting this entry!! I ordered everything late Sunday evening (no shipping on Sundays), and here it is in my home already (Tuesday afternoon)! They're always so fast with their shipping. I didn't want to hope they'd get it here today--but, they did! I know I sound like an advertisement for Natural Zing by now, but they really are as great as I'm saying. I hope there are some olives left when I get home! mmm, I have 4 bags of the olives you speak of (used to be 5). I am missing the family you speak of(Jeff and Helen). I am eating the food bought from the wonderful company you speak of (natural zing). Rawbin. :-) The three of us together create magical fun and loving energy. I love me some Natural Zing! It is by far my preferred online store of choice. Jeff and Helen have great integrity and spirit. I feel good spending my money with such a fine company and family. Great plug and information! you truly know those running it are genuinely good people! Very well written, I just loved reading it, keep posts like this coming, I am totally impressed with your posts, keep posting. I love Natural Zing! Getting their packages in the mail has been a great source of encouragement and supplies for my new raw lifestyle. I've had no small experience with being vegan, but raw just makes sense...I always did eat lots of fresh produce anyhow! Natural Zing has provided many of my non-supermarket extras for food and prep, and I've found they're a great source of sweet treats too. It's all the better to know that they are run by wonderful people who really deserve our business!